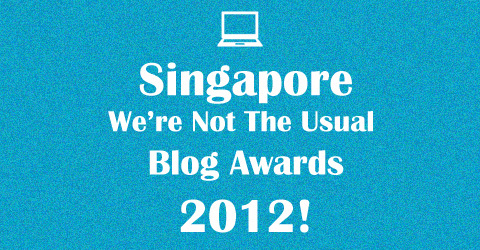 The Singapore We’re Not The Usual Blog Awards 2012 – Categories! Ok so there’s this yearly blog awards that’s happening right now and a lot of people on twitter and such have pretty much said that they don’t fit in any categories (including me). It’s always the usual foodie/lifestyle/fashion whatever blogs. Surely there’s more blogs than that! If it were only that, I’d be totally bored. So I decided to do this. No prizes since this would the first time trying this out. Unless by the middle of this whole experimental thing, people start to donate prizes and stuff. We’ll see then. However, with all the listings, we’ll finally learn more blogs than the usual ones we see in the news/media/linked to us. So that would be pretty neat, wouldn’t it? Alright, now I need YOUR help! I have planned down some categories but I know I might be missing out some, click on read more to see and also COMMENT with your suggestions! The categories will then be finalized for the nomination of blogs on 18 May. What do you think of the categories above? Yes/No? What else should be there? Some subcategories might be merged into the main category during nomination if there’s “not enough” in that particular specialty. Oh and of course, there’ll be a prettier banner and stuff by nomination time. COMMENT BELOW! Previous Previous post: War is Coming!